Does your kitchen or bathroom need renovating? The kitchen and bathroom are focal points of any home, and a good kitchen and bathroom renovation can significantly increase the value of your home if it is done properly and done well. Maybe you just want to renovate for yourself. Either way, we are great at listening to your needs to get the job done right, that is a guarantee! We can give you advice on how to go about it. Renovations can be overwhelming. It is best that you hire experienced plumbers to help you get your renovations done properly and exactly the way you want them. They will last longer and it works out cheaper in the long run. Call us for fast, friendly and reliable service…and a great looking kitchen and bathroom! Kitchen and bathroom renovations can be overwhelming. We can do a lot of the work for you, making your renovations hassle free. Good advice is valuable, and we know how important your kitchen and bathroom renovations are. We can make sure you get good value and advice for your money. You do not need to spend a huge amount of money to make improvements to your bathroom or kitchen. We can work with your budget to make improvements to these areas. What aspects of renovations do you complete? We can move or install hot and cold water points, drainage and gas points as well as install and replace appliances and fixtures such as taps, toilets, basins, baths, sinks, dishwashers etc. Do you do tiling and waterproofing? Our work in regards to renovations revolves around water, drainage and gas. 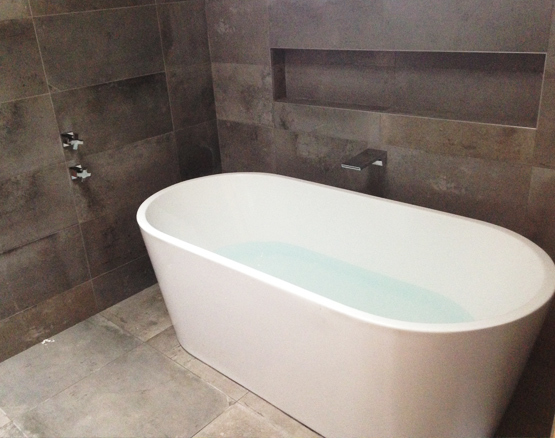 We do not do any waterproofing or tiling in kitchens, bathrooms or laundries. What is the timeline of a renovation? Once you have worked out what you want, we will cap off existing points. When the room has been stripped we will rough in the drainage and water points, returning to fit off once structural work is complete. "I don't usually review businesses, but feel compelled to do so because TASM plumbing's Tom was outstanding to deal with. He was prompt, reliable, friendly and reasonably and fairly priced. He did a great job and left the place immaculately clean. He also explained everything fully to me. I can not recommend this company highly enough, and will be using them for ALL of my plumbing jobs in future."